Rev. Dr. Susan Henry-Crowe is General Secretary of The United Methodist General Board of Church & Society with offices on Capitol Hill in Washington DC and at the Church Center for the United Nations in New York City. Church & Society’s primary areas of ministry are Advocacy, Education & Leadership Formation, United Nations & International Affairs. 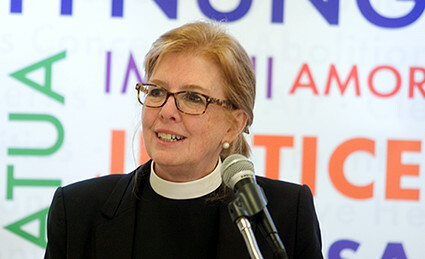 Prior to her current role, Susan T. Henry-Crowe served for twenty-two years as dean of the Chapel & Religious Life at Emory University in Atlanta. Dinner registration is available online NIJFON.org/dinner2016. For more information about sponsorships and tickets, contact Judy Siaba at jsiaba [at] umcnic.org or 312-346-9766 ext 724.